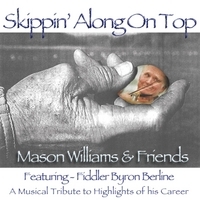 A musical biography medley of highlights of Byron Berline's career. Byron Berline & I have been pickin’ friends since 1963. Back in our early Oklahoma days of yore, we met playing at a Hootenanny Folk Festival at the University of Oklahoma in Norman, Oklahoma. We’ve stayed in touch over the years & I was therefore aware of his many recordings & performance adventures & his evolution into being one of the greatest Country & Bluegrass fiddlers of all time. Coincidentally, I, therefore, knew a lot about his career. We played a lot of music together, (135) shows & (40) of ‘em with symphony orchestras! We called the music we played “Crabgrass” because it kept coming back. I decided to put the spotlight on Byron & write this song about him to play in our concerts as a way to introduce him & with a medley of highlights of his musical career to the audience. The piece evolved in a few details over the years, but the band always seemed to enjoy the challenge of playing an ever-changing complex arrangement & the crowd loved it to. Recorded live in the studio in 1995 at Don Ross Studio in Eugene, Oregon.